I am trying to set up Equinox using TLS, however certificates are driving me nuts! This is on an IP500, I have the cert from the 500 installed on my PC OK, works fine with Web manager. could anyone shed any light on this for me please? Is there a 46xxsetting.txt file in your directory? If so, delete it, and let the system auto=generate a new one. Buy a UCC cert from go daddy and set your SANs (Subject Alternative Names) with your FDQN and SIP domain names. Equninox is quite picky with TLS certs. wildcards (*.domain type) are not allowed with SIP traffic. This way you don't need to install anything on the PC, it will 'just work' with the auto gen 46xx. Just to note though. When using these type of certs there seems to be a mjor issue with ASBCE not likeing them with J100s which we have out with Avaya currently. jamie77 - I was coming to the conclusion that a 3rd party cert was the only way I was going to sort iy. The self signed ones cause no end of bother. Definitely go the UCC SAN cert route. It will work better and is more secure. Not recommending it but I have got it working with Wildcards. Search this forum and I'm sure you'll find it in one of the J100 or Equinox threads. Works with both (no SBC). @jamie77 - thanks for the heads up on the TLS and ASBCE - Classic Avaya. Although now there is TLS and encrypted calls we don't deploy SBC's for remote access. We only use them for SIP trunking. We use Sonus (Ribbon). What kills me was how easy it was to connect a Polycom via TLS to the IP Office when it took me weeks to get it working with Avaya's own products! Thats why we love 'em!! Evrything is so easy!!! Equinox works OK using TCP, in-house but I get a constant warning triangle that the Contact Service is Unavailable? I have setup a lot of Equinox with Certs. Its all in the Knowledge base. Piece of advice do not touch 46xxsettings file keep it autogenerated unless you have expierence with Custom Certs, this is not needed in this case. I have a Go daddy UCC cert set with the FQDN and SIP domain. Equinox still doesn't not like it. The 46xxsettings is auto gen, do I need to save the cert as WebRootCA.pem and upload it somewhere? I should add that I am having problems with the mobile app on Android. The desktop app in-house seesm fine with the new cert. "do I need to save the cert as WebRootCA.pem and upload it somewhere?" Yes, to System > Primary folder. Strangely if I look at the certificates in Web Manager using Chrome I see The Certificate. If I use IE I do not. Did you upload the intermediate certificate? I got back from Go Daddy our actual cert and a bundle cert wich I assume inludes the intermediate and Go daddy root ca cert? I have out cert set in the IPO and the Go Daddy root ca, although not sure I should need that? mediate to the trusted certificate store? 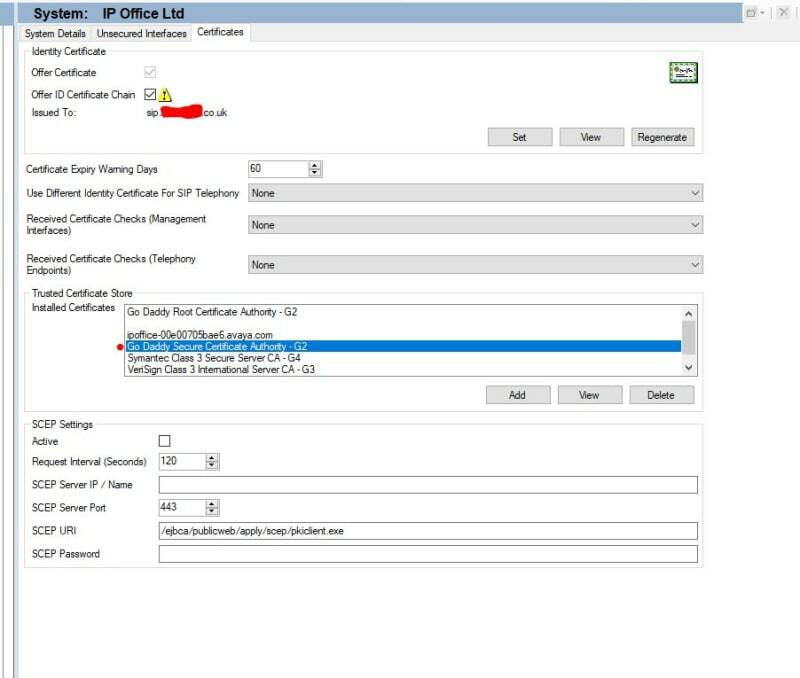 You usually need to enable "Offer ID Certificate Chain". I don't get how you exported the Cert from Chrome. You should have a PFX cert with the certificate and the intermediate that you import through the web interface. Go Daddy will give you your ID Cert, a key file and the CA/Root Bundle (gd-bundle-g2-g1.crt). Put all these together as a .P12 and upload in to the IPO. It will put everything in the right places for you. Yes did that using openSSL and the private key on a Linux machine, and the IPO accepted the P12 so I think that's all in place. So I see different things whether I look at the certificates in Chrome, IE or via manager Security settings. In Manager I get the below. Looks just like ours, but in a different order. Not sure the order matters though! The one with a blank name is a Go Daddy one too. Ours is using an auto gen 46xx. Only other thing is SIP domains etc in the LAN settings. Should work like that. Can you reset Equinox (Settings>Support>Reset Application) and let it load everything again? I will doible check the SIP domains in the IPO but if I need to change I will have to do that tonight due to rebooting. It's interesting that once I have enabled Offer certifate chain it stopped complaining about the certificate and started complaining about the configuration pasing error. This is with an auto gen 46xx. If I set up the app manually it seesm to work but I get a red triagnle complaining the telephony is not connected even though I can make a call. But this is only the IP Office, don't you need to install the certificate through Platform View so the certificate gets installed on all applications? , at least that was the way when implementing One-X or WebRTC. I did ours via Manager security only. I have struggled to upload certificates via Web manager, they often get rejected as invalid certificate.